AT&T has begun its mmWave network in 12 cities in the US – albeit via 5G mobile hotspot devices – with Verizon about to follow suite, Telstra is close to releasing 5G in Australia, while EE is on the cusp in the UK. Everyone knows 5G is about blistering fast download speeds – and we also now know that 30 5G devices (mostly phones) are coming in 2019 – but what else will it do? Here's what we learned during an eventful week at CES 2019. This is the big one, and it's not much talked about because 5G is largely thought of as a technology for those on-the-go. At present, if you live or work in an area that has fiber optic cable underneath the road, you can have super-fast broadband. If you don't have that infrastructure, tough luck. That all changes with 5G, which gets rid of the need to physically connect a home or an office to a cable running down the street, but also makes huge plants and factories cable-free. "That's a lot of why some of the our enterprise customers have been knocking on our doors asking about 5G because they see it as a way to not have to wire their facilities," said Alicia Abella, VP of Advanced Technology Realization at AT&T. At CES 2019, Belgian company Mimesys showed-off 5G-enabled holographic remote collaboration using Magic Leap's mixed reality headsets (and also some awesome holographic business cards). AT&T also reaffirmed it plans to launch of a 5G zone on the Magic Leap campus in Plantation, Florida, during 2019.
mmWave 5G means a lot of small boxes around cities, not huge base stations. Those boxes will have to use all-new housings that don't block or affect the bandwidth. "5G is about density – we will see fewer base station towers with huge antennas, and many more nano-cells, router-sized housings that emit the signals," said Dr. Günther Walze, Technical Marketing Director at Covestro, who is researching exactly what kinds of plastics and materials allows 5G signals through unaffected. Phone designs will also have to change. "Metal housings on phones work for 4G because the antennas do not take up much space, and they are on the edges," said Walze. "With 5G you have to have several antennas that are too large for the edge, so have to go through the back, and that makes a full-metal back very difficult." We know that for autonomous cars, 5G is an enabling technology. After all, they will need to talk to the cloud, and to each other, and instantly to avoid crashing. That limits where they can go. "Our emphasis will begin in urban areas where you can have more coverage and where you're going to have the density of traffic to want to take advantage of traffic management, and collision avoidance," said Abella. Welcome to edge computing, the enabling tech for 5G. Yes, 5G does mean an instant connection to the cloud, but only if you have the cloud close by. So instead of creating a load of massive data centers, 5G will see mini-clouds installed where they’re needed. "It's about bringing the compute power closer to where the end device needs it so that you can reduce latency," says Abella. "5G is an enabler to edge computing because it's going to help us get some of those high speeds." For example, in rural areas mmWave is likely to be installed on street-lights, with compute power close by. "If you need to do real-time analytics or processing you can't afford to go from that rural area back to some data center far away, so you'd want to have something more closer to the roadside that can do the processing for you." At CES 2019, Sharp was showing off a 5G TV, but it wasn't meant for the home. "Sharp already has 8K camcorders so we can film the players in a stadium, encode it, then transit it via a 5G system to be received on the other side of the stadium on a big public viewing system," Atsushi Shirakawa, Researcher at Sharp's Telecommunication and Image Technology Laboratories, told us. The country is counting down to Tokyo 2020 Olympics, which will be broadcast in 8K by NHK. Whatever kind of gear they use at home, gamers have to switch to smartphone games when they're not at home. With 5G, that changes; you'll be ablate take any game anywhere on a phone and get the same performance as on a console back home. 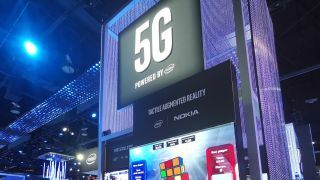 A demo on the Intel booth at CES saw a live 5G connection using Ericsson network gear. "You feel like you're playing locally on a PlayStation, but it's actually all on the server," said Santi Magazu, VP Business Development at PlayGiga, a cloud gaming provider that for now requires a fibre-optic cable connection. "This means you could play all the games you play at home on the move, such as in a car or while commuting," he added. That extra speed and an instant connection to the cloud could mean much more advanced personal assistants on souped-up Google Glasses and in-ear hearables that can do incredible things almost instantly. "It's my fantasy that I will one day have a device in my ear that tells me who I'm about to shake hands with," said CES supremo Gary Shapiro. "Preferably without anyone else realizing that I'm being told." At CES 2019 Shapiro got a glimpse of his wish; the OrCam MyMe, a wearable camera and 'second brain' that has an AI capable of recognizing faces and text. Expect a lot more tech like that in the 5G era. Real-time translation tech is everywhere, but actually using it in real life – where it's needed – is challenging because it's just too slow to enable proper conversations. Forget for a moment that Google Translate usually gets everything wrong, and instead consider how 5G will allow it to work instantly. The same goes for offline handheld pocket translators like Travis, Pilot, and ili. Think there's a movement for limiting screen time and becoming less obsessed with our phones? Forget it – 5G will likely tie us to our phones even more than they already do. "We are going to be even more connected at all times to a smartphone," says Dan Pitchford, AI expert and Co-founder of AI Business. "You already see people walking down the street not looking where they're going, fixated on their phone, and there's probably going to be an increase in that [with the introduction of 5G]."